Choosing the Best J Bolts For The Job | Custom Bolts | R & R Engineering Company Inc. When used as anchors in concrete, the American Concrete Institute (ACI) provides detailed specifications for J bolts based on force, weight, and other factors. Typically, there are standard sizes of these anchor bolts found at most industrial suppliers. However, some uses require more specialized J bolts that may not be covered by the standard specifications. When this is the case for your project, R & R Engineering is here to assist with custom bolts that are designed-and-produced with to your exact specifications. We specialize in custom bolts for all industries. We can provide all shapes of bent bolts, and provide specialty fasteners. In addition to our custom capabilities, if there is a standard size j bolt or bent bolt you are using we can customize a stock and release program for you, so we are truly a one-stop shop. Our state-of-the-art equipment, and our specialization in the industry, allows us to handle a job of any size: from small projects, to large OEM orders. 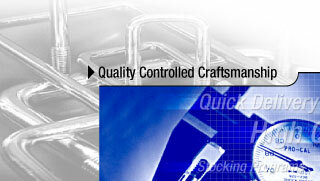 If you are not sure what type, size, or thread of J bolt will fit your needs, talk to our staff. We know what questions to ask so we can best understand just what it is you need. The overall length of J bolts is measured from the flat base to the bottom of the rounded part of the J. This is done on the outside of the bolt. The width is the inside measurement in the J. It is possible also to use what is known as an L bolt, which has a flat rather than hooked bottom. We would be happy to discuss the different applications of these two options with you. Finally, we will need the diameter of the bolt, measured at the bottom of the bolt as well as the length of the threaded area. Once we have these measurements, our engineers can work with your team to make sure the bolt offers the strength and compliance that you need for your project. Our representatives are ready to help you! Contact us today to discuss how we can help you with your next job: (800) 979-1921.